Happy Halloween! My last Halloween project for 2014. There's a hand sanitizer inside these boxes thanks to the tutorial here by Erica Cerwin. They're off to my three fav college gals along with some other Halloween goodies. This also qualifies for the SUO Challenge#108-Treat's the Thing-here. This card uses the Freshly Made Sketch#160 here. 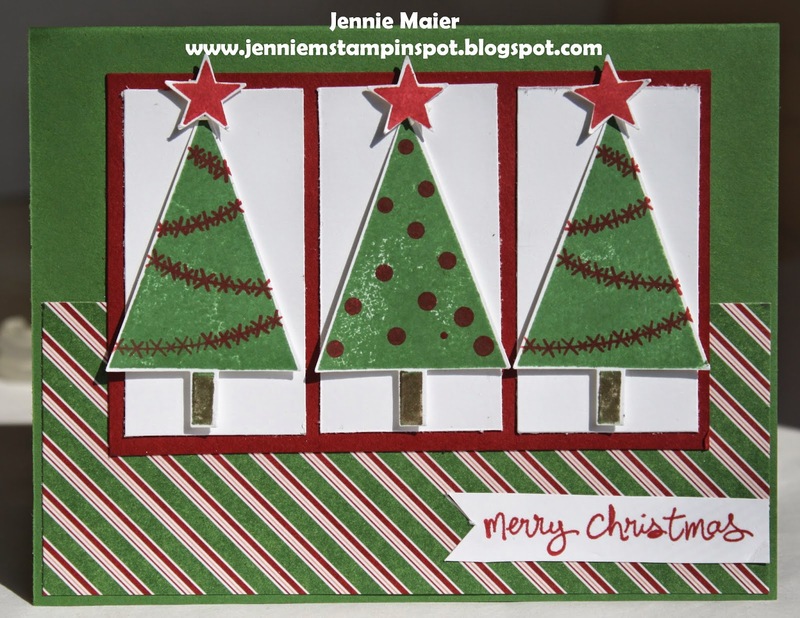 Making Spirits Bright and Christmas Bliss are the stamp sets with some Trim the Tree DSP Stack. This card uses the MojoMonday Sketch#369 here. 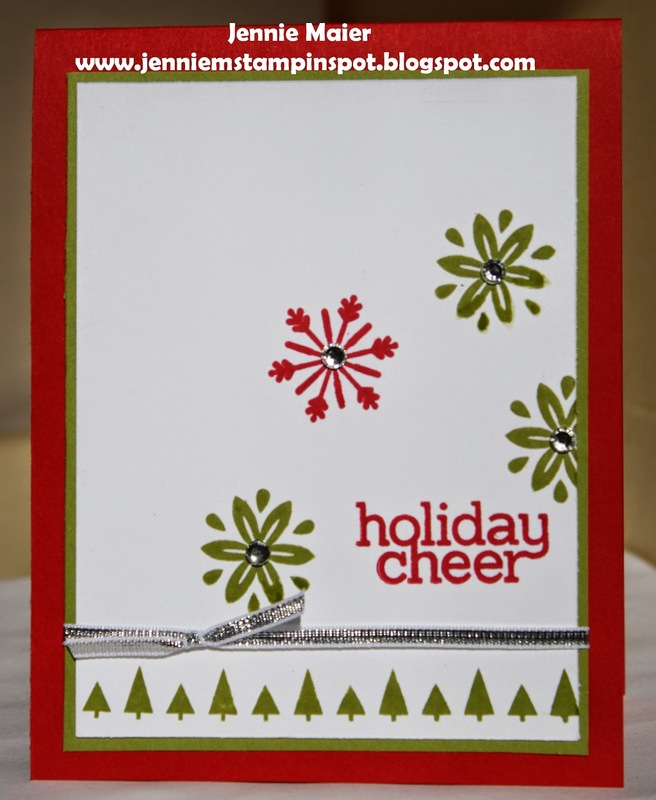 Cheerful Tags and Good Greetings are the stamp sets with some Under the Tree Specialty DSP. 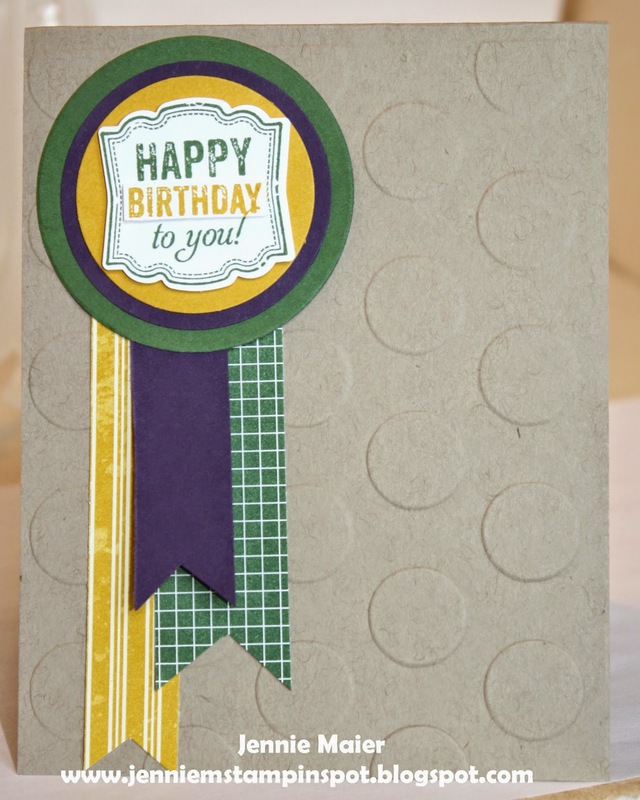 This card uses the Create with Connie and Mary Challenge#326 here. It's a color challenge to use Mossy Meadow, Lost Lagoon and Silver. Festival of Trees is the stamp set with some Moonlight DSP Stack. This card uses the Splitcoast Sketch Challenge#511 here. Fall Fest and Making Spirits Bright are the stamp sets and there's some Sweet Taffy DSP. Here's a Christmas card for two challenges. First, I used the Splitcoast Color Challenge#501 here. The colors to use are Real Red, Crumb Cake and Coastal Cabana. And second, the PPA#225 here. 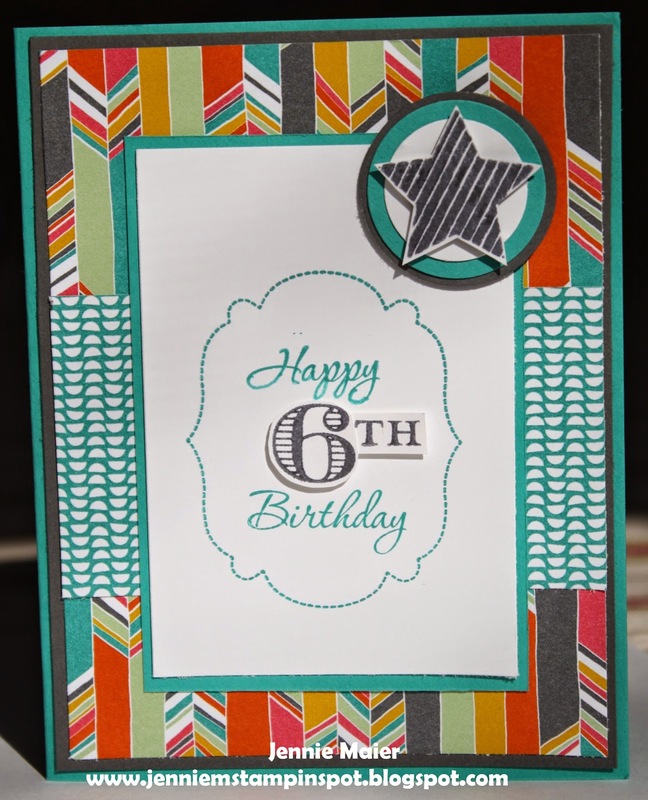 Cheerful Tags and Good Greetings are the stamp sets with some Brights DSP Stack. Need thank you's for Max's birthday presents and this one I finished super quick thanks to the Freshly Made Sketch#159 here. 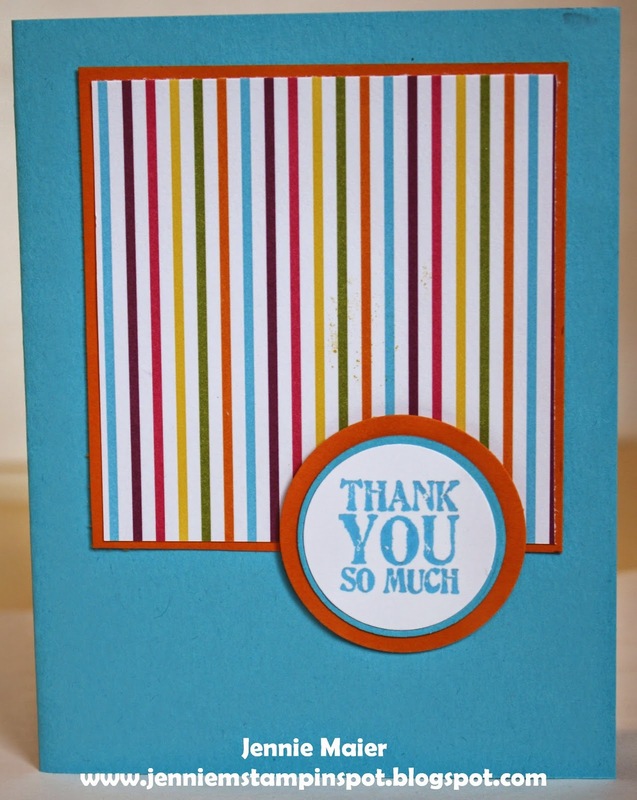 Lots of Thanks is the stamp set with some Sweet Taffy DSP. Yet Another Clean and Simple Christmas Card! 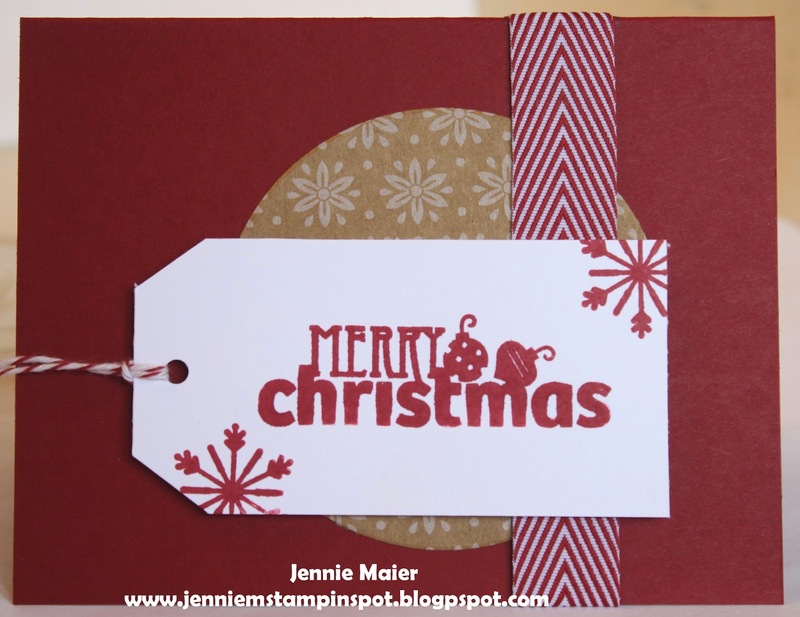 Another Clean and Simple Stamping card. It's the FTL#311 here. 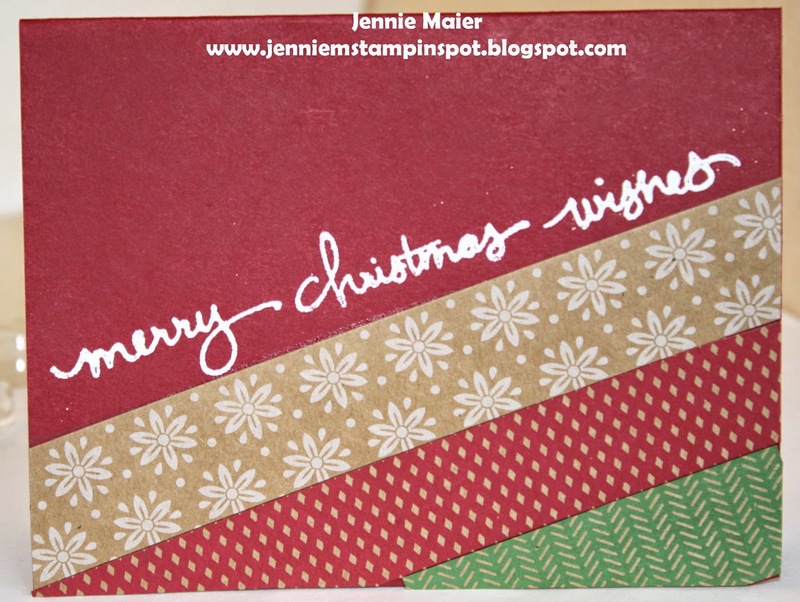 Endless Wishes is the stamp set with some Under the Tree Specialty DSP. This birthday card for my nephew, Patrick, uses the MojoMonday Sketch#368 here. Memorable Moments and the star from Christmas Bliss are the stamp sets and some Confetti Celebration DSP. 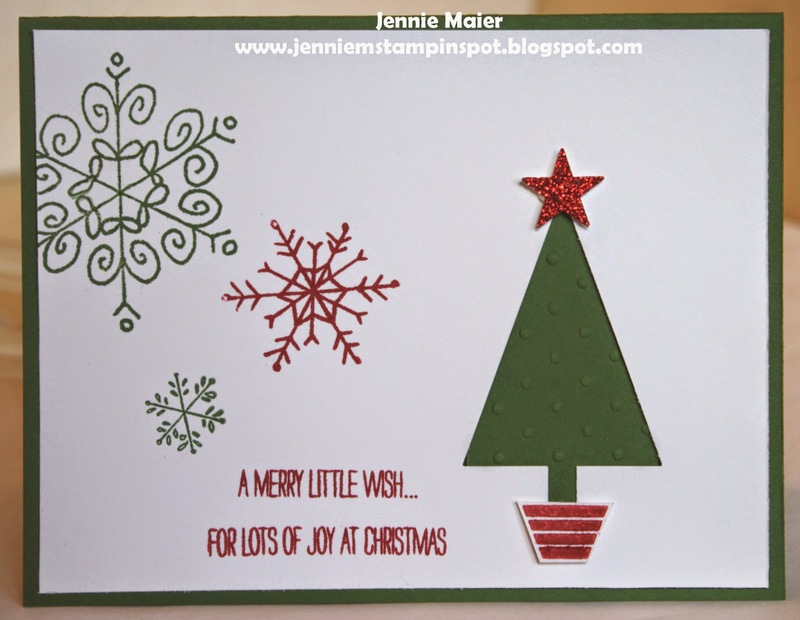 This card came together quickly thanks to the Create with Connie and Mary Sketch#325 here. 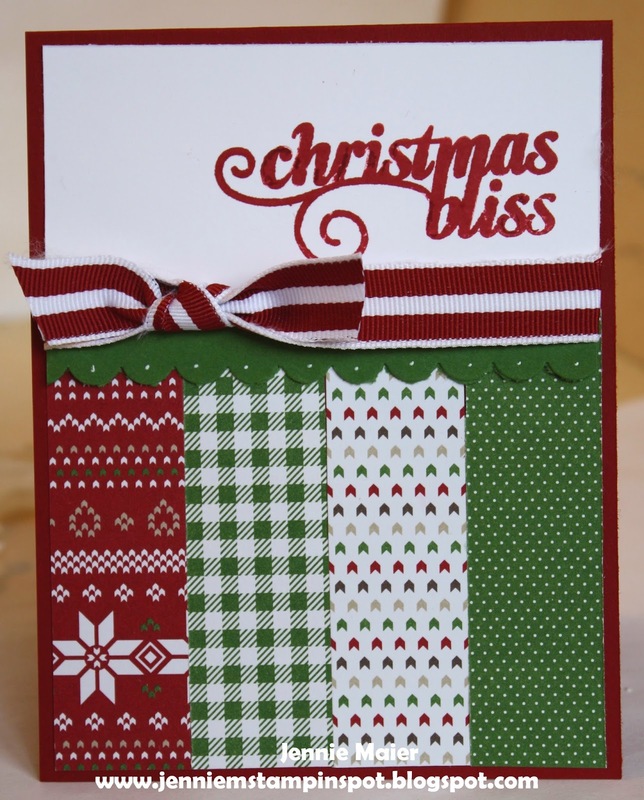 Christmas Bliss and Cheerful Tags are the stamp sets with some Under the Tree Specialty DSP. Just need to make a few more Halloween cards so I used a sketch and color challenge for this one. First, I used the PPA#224 sketch here. And second, the FabFri#52 here. It's a color challenge to use Basic Black, Tangelo Twist and Blackberry Bliss. Making Spirits Bright is the stamp set with some Back to Black DSP, Confetti Celebration DSP and Moonlight Stack DSP. 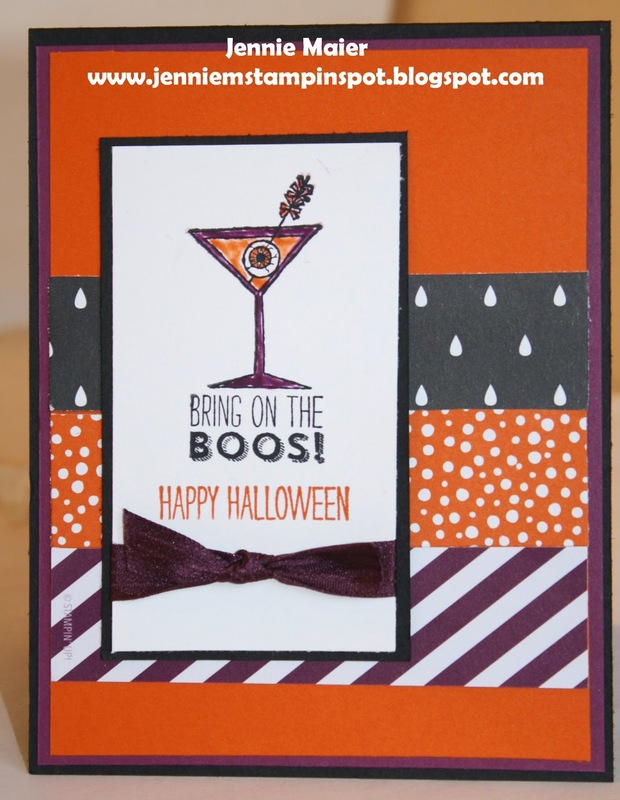 A Halloween card using the Splitcoast Sketch Challenge#510 here. 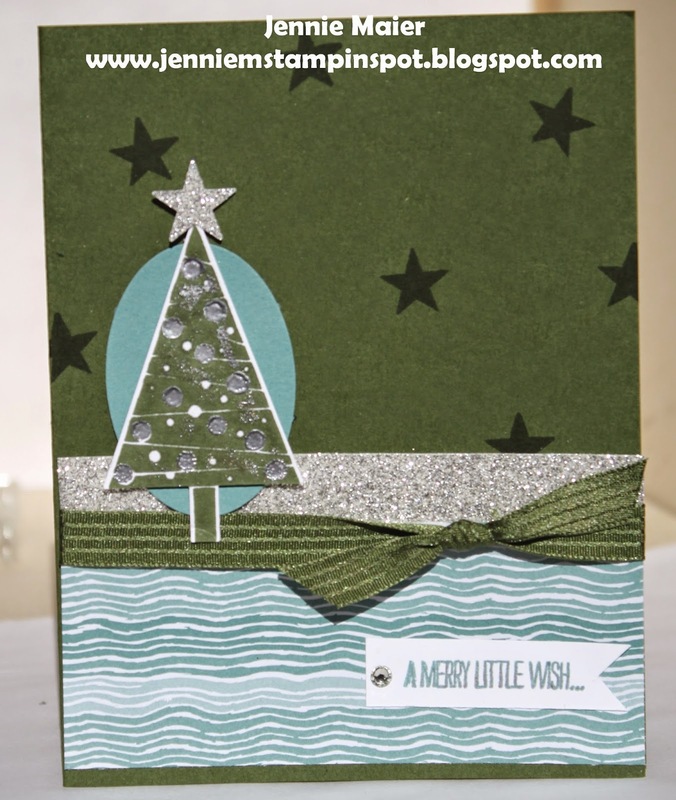 Making Spirits Bright is the stamp set with some Confetti Celebration DSP. I used the Clean and Simple Stamping FTL#310 here. 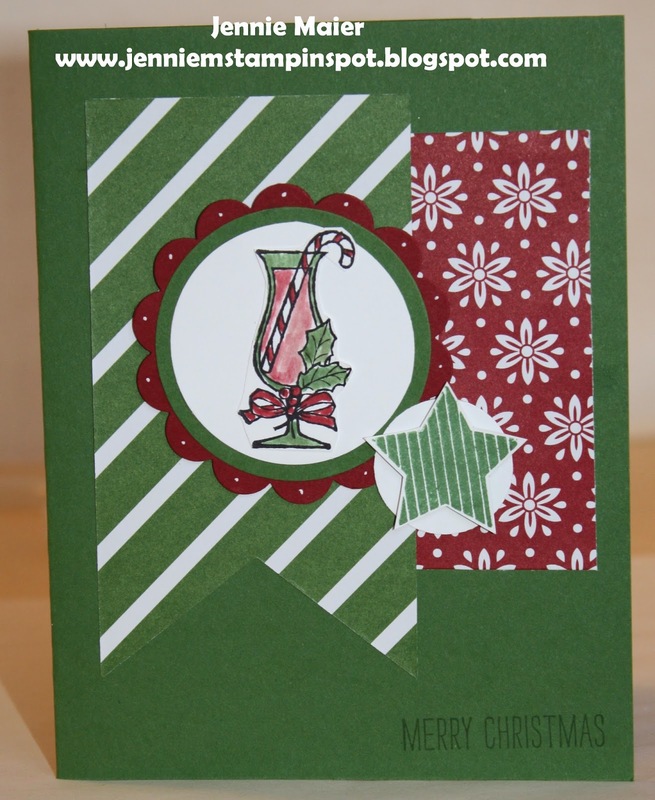 Festival of Trees and Christmas Bliss are the stamp sets with some Trim the Tree DSP. This thank you duo was made for two challenges. First, the Freshly Made Sketch#158 here. And second, the Splitcoast Color Challenge#500 here. The challenge has four "seasonal" color combinations. So I chose fall-Bermuda Bay, Baked Brown Sugar, Crushed Curry and Cajun Craze. And since this was such a quick card I made another one and chose summer-Blushing Bride, Rich Razzleberry, Mossy Meadow and Pear Pizzazz. I was also inspired by this card I saw on Splitcoast here. It's my son's 16th birthday today. Happy Birthday to a bright, goofy, kind, fun-loving, athletic and cute young man.! Here's a birthday card using two challenges. 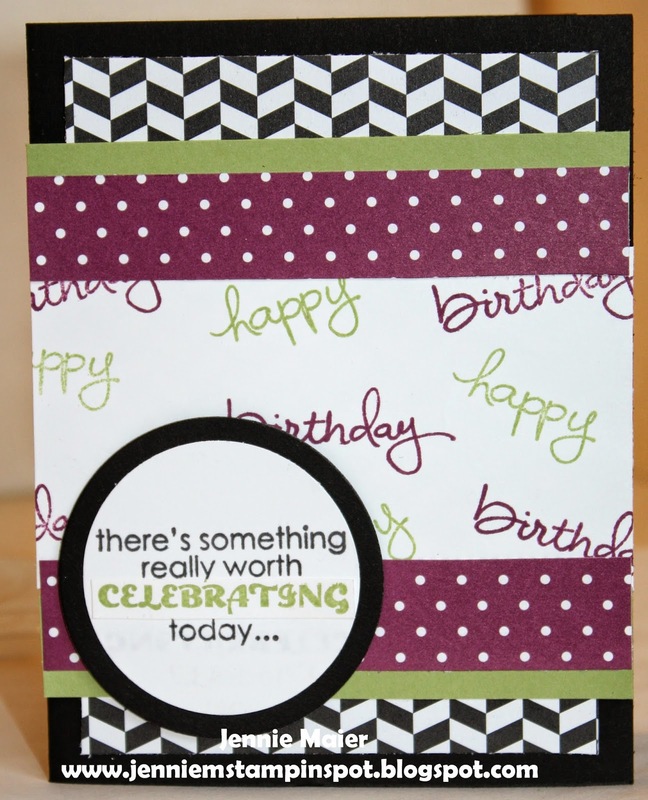 First, I used the Stampin' Celebration#89 here. And second, the Hand Stamped Sentiments#196 here. It's a color challenge to use Basic Black, Blackberry Bliss and Pear Pizzazz. I just substituted some Rich Razzleberry. Remembering Your Birthday and Endless Birthday Wishes are the stamp sets with some Back to Black DSP and Brights DSP Stack. This card uses the MojoMonday#367 here. 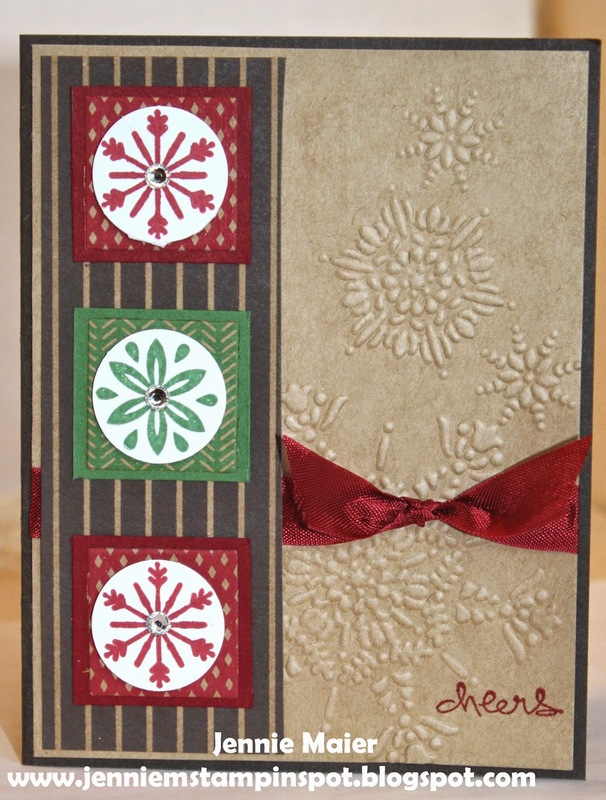 Christmas Bliss is the stamp set with some Trim the Tree DSP Stack. 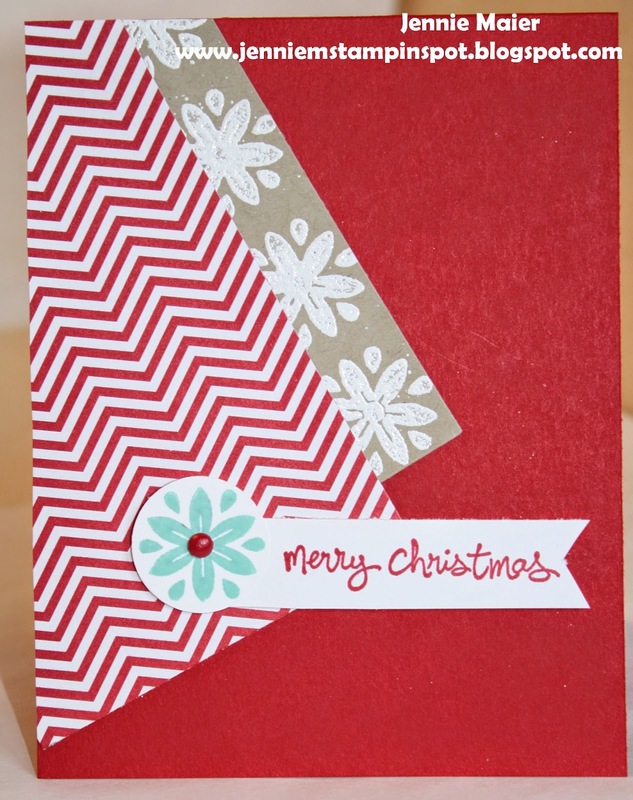 This card was inspired by Mary Brown's cute card here. I just changed up the colors and added some ribbon. Cheerful Tags is the stamp set. A little ribbon and some Basic Rhinestone Jewels and it's done! This card uses the Create with Connie & Mary Challenge#324 here. It's a color challenge to use the colors Cherry Cobbler, Garden Green and Baked Brown Sugar. 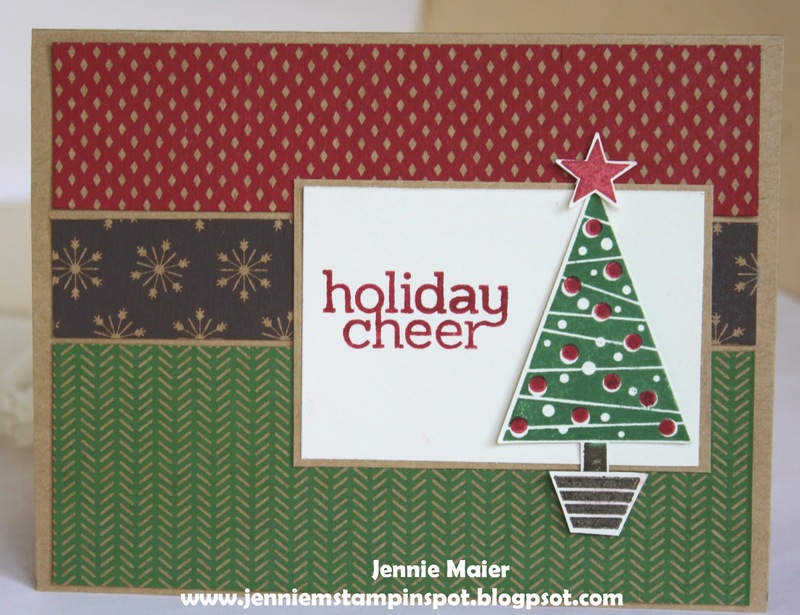 Festival of Trees and Good Greetings are the stamp sets with some Trim the Tree DSP Stack. 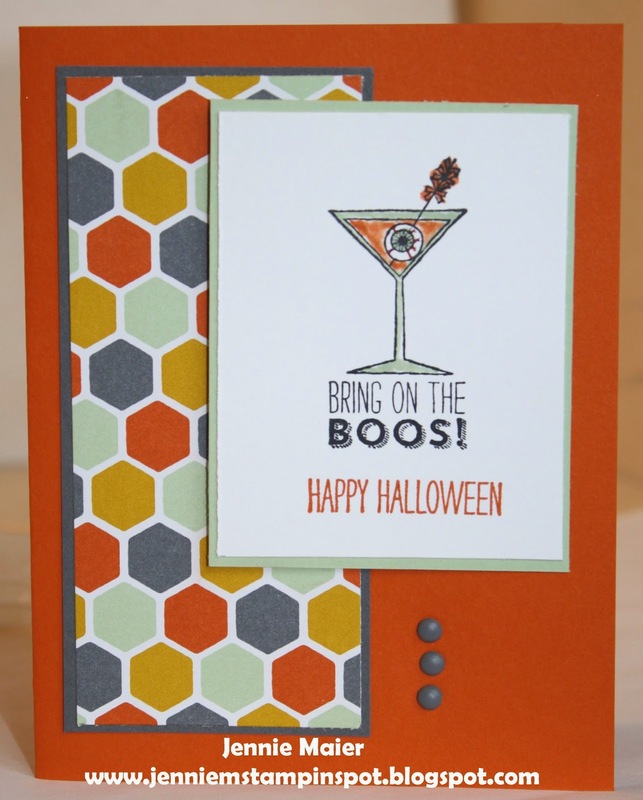 This card uses the PPA Color Challenge#223 here. The colors to use are Tangelo Twist, Basic Black and Very Vanilla. I just substituted Whisper White because that was in the DSP's I used. I also used the Freshly Made Sketch#157 here. Good Greetings and Fall Fest are the stamp sets with some Confetti Celebration and Back to Black DSP. This card uses the Splitcoast Sketch Challenge#509 here. 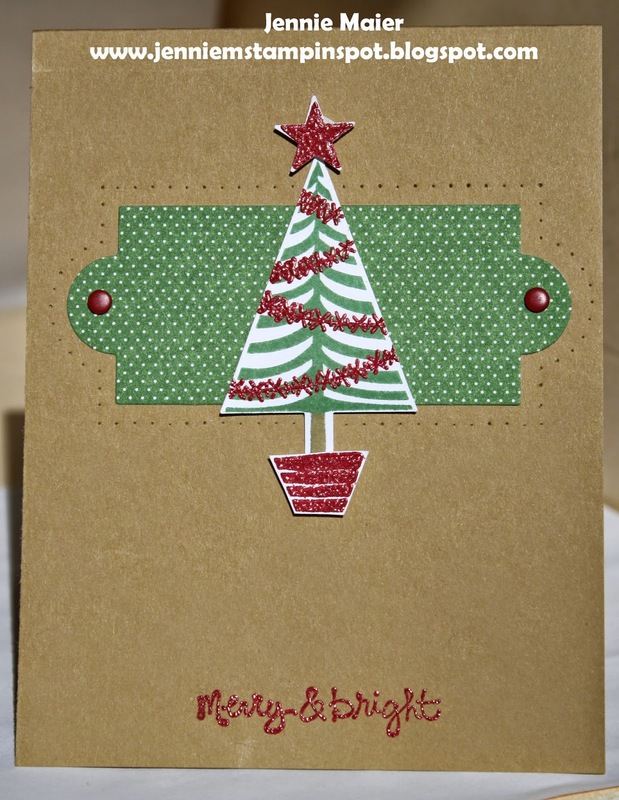 Festival of Trees and Cheerful Tags are the stamp sets with some Under the Tree Specialty DSP. I have three male relative's birthdays coming up in October so here's a perfect masculine birthday card. 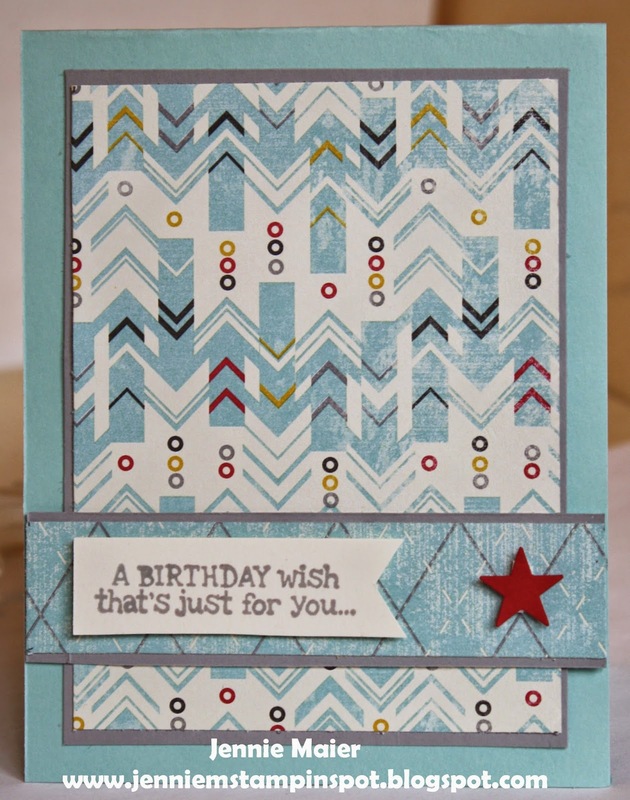 Remembering Your Birthday is the stamp set with some Flashback DSP. 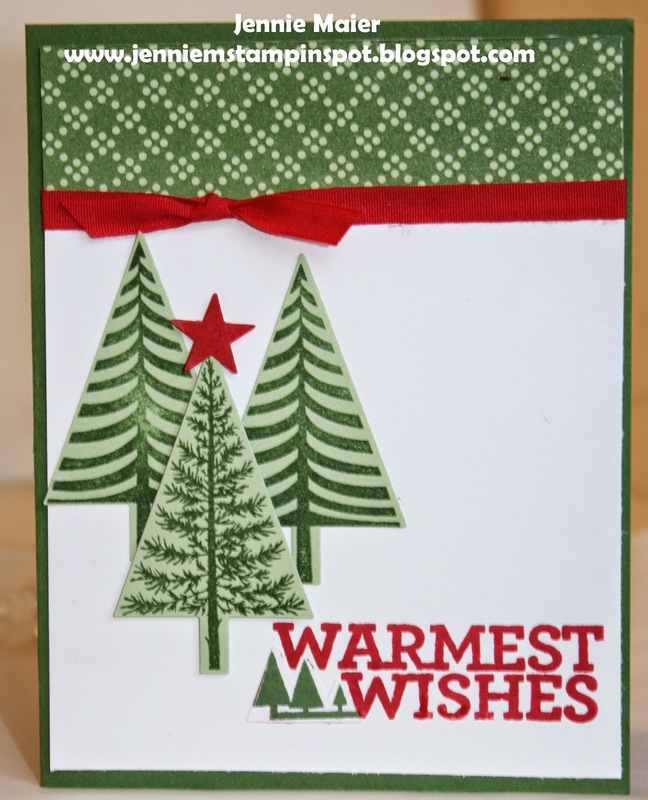 This Christmas card uses the Festival of Trees and Endless Wishes stamp sets. And I punched out the tree with the Tree punch and layered some paper embossed with the Perfect Polka dots folder for some texture. This card uses a sketch and color challenge. First, I used the MojoMonday Sketch#366 here. And then the PPA Color Challenge#222 here. The colors to use are Early Espresso, Calypso Coral and So Saffron. 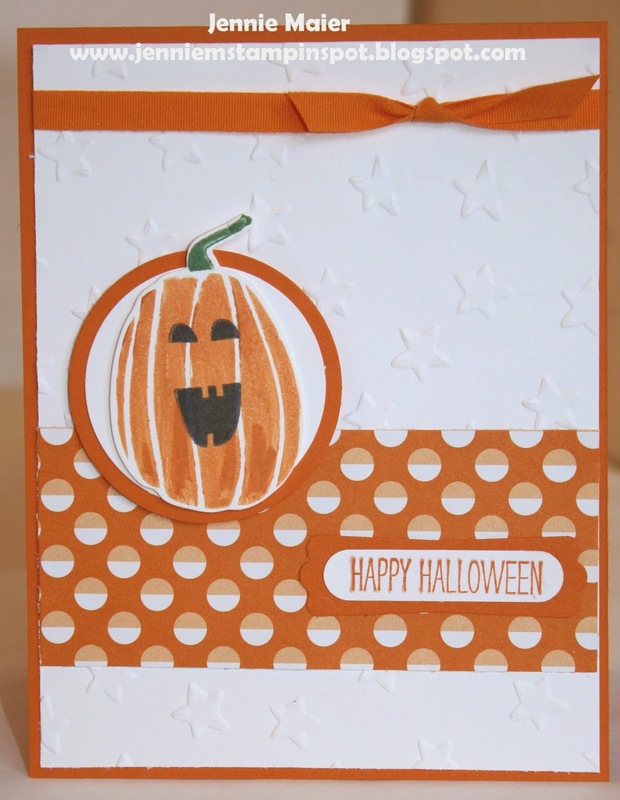 Fall Fest and Good Greetings are the stamp sets with some Trim the Tree DSP Stack. This card uses the Splitcoast Sketch Challenge#508 here. Festival of Trees and Good Greetings are the stamp sets with some Trim the Tree DSP. 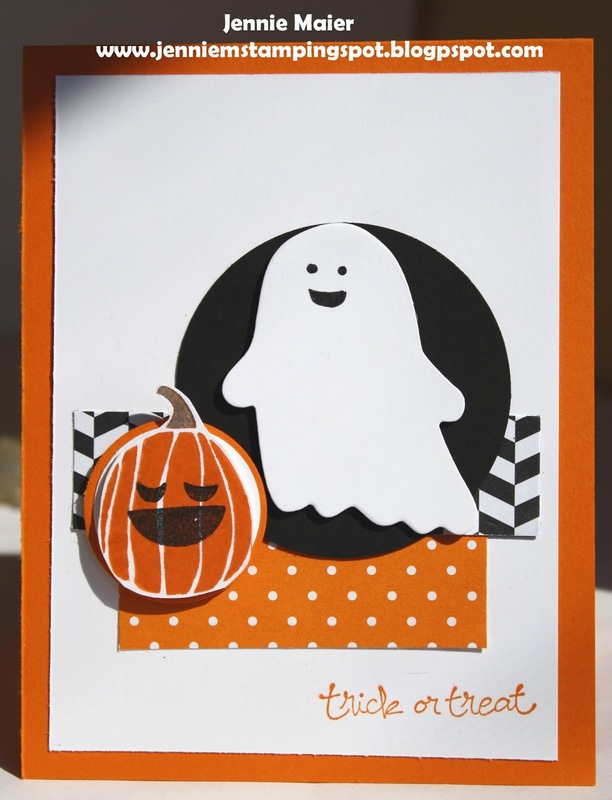 This Halloween card is for the Freshly Made Sketch#156 here. 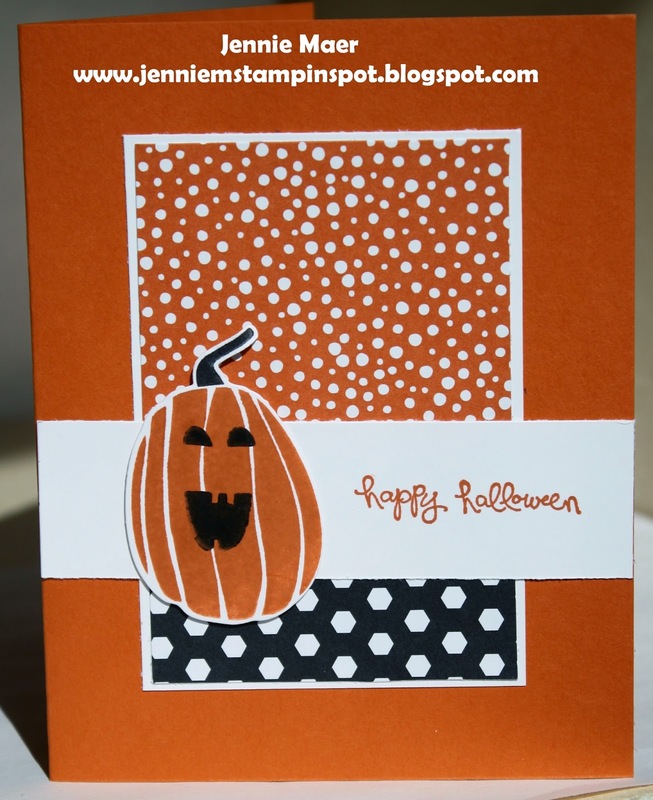 Fall Fest and Good Greeting are the stamp sets with some Back to Black and Brights DSP Stack. This card uses a sketch and a color challenge. First, I used the Fab Fri#51 here. And then the Splitcoast Color Challenge#498 here. The colors to use are Garden Green, Crushed Curry and Elegant Eggplant. Label Love is the stamp set with some Flashback and Flowerpot DSPs.